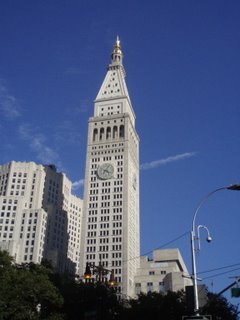 Built on Madison Square in 1909, the 51-story MetLife Tower ruled as the world's tallest building until the Woolworth Tower went up downtown four years later. The MetLife completed a multi-year renovation in 2002 and today you'd swear it had gone up yesterday, not 97 years ago. My late aunt once had an office behind one of the clockfaces, screwing her out of a fabulous view of Madison Square Park below, the original site of Madison Square Garden. The perimeter of the park may be the single best viewing point for landmark NYC buildings, affording spectacular views including the Flatiron, the Empire State, and the NY Life tower. Trivia: The minute hand on each of the four clockfaces is 26 feet long and weighs 1200 pounds.